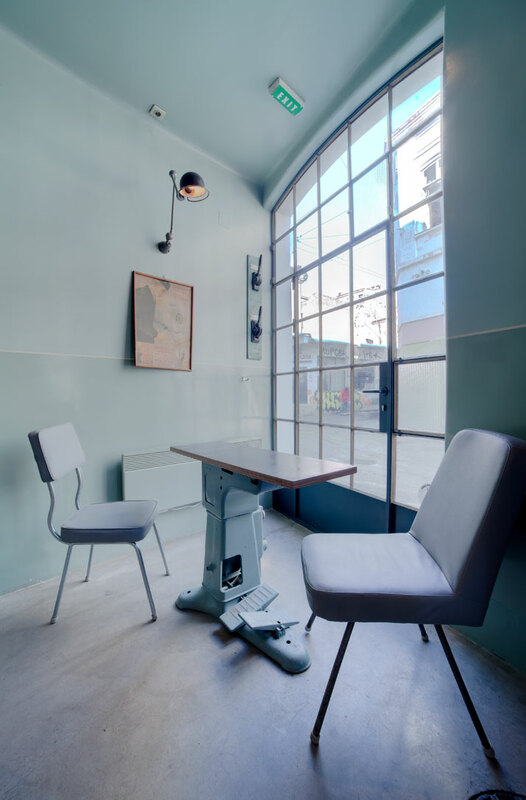 Earlier this year, we foresaw this forthcoming trend; a casually untouched interior design approach, where vintage pieces, salvaged leftovers and industrial design blend to form a unique interior such as the likes of The Former Abandoned Garage. It might be the world wide economic crisis, it might be the trends asking us to reduce, reuse and redesign but undoubtedly the result is spectacular. 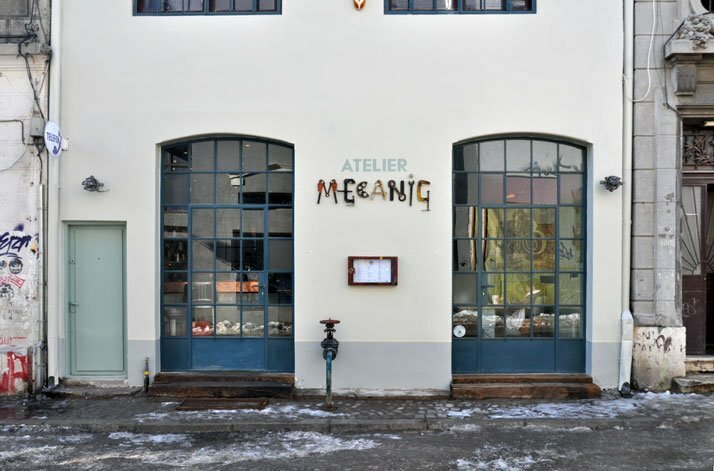 Designed by the young, dynamic architect Corvin Cristian and with the collaboration of architect Serban Rosca, the ‘Atelier Mecanic’ or Mechanical Workshop, in English, is a bar in the Old Town of Bucharest, Romania. Undoubtedly, as soon as you walk through the industrial grid shaped door, you will fall in love with it! 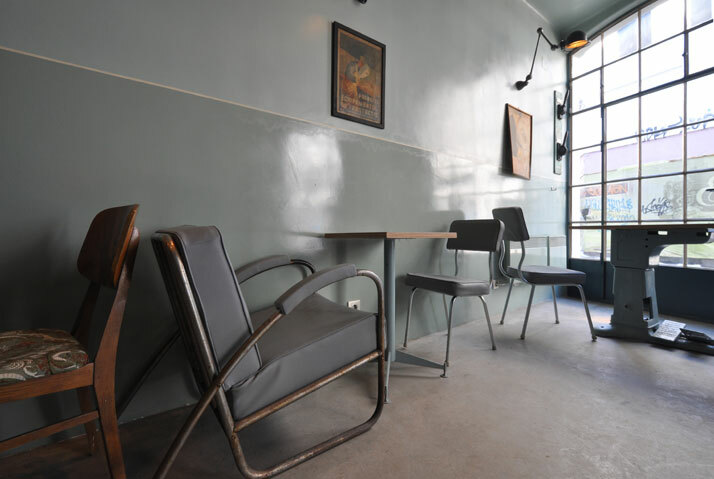 Apparently, the Old Town of Bucharest had been looking for something different like Atelier Mecanic for a while now; this modernist, vintage bar/café where every chair and table is different has something of ''what communist Britain might have looked like.'' 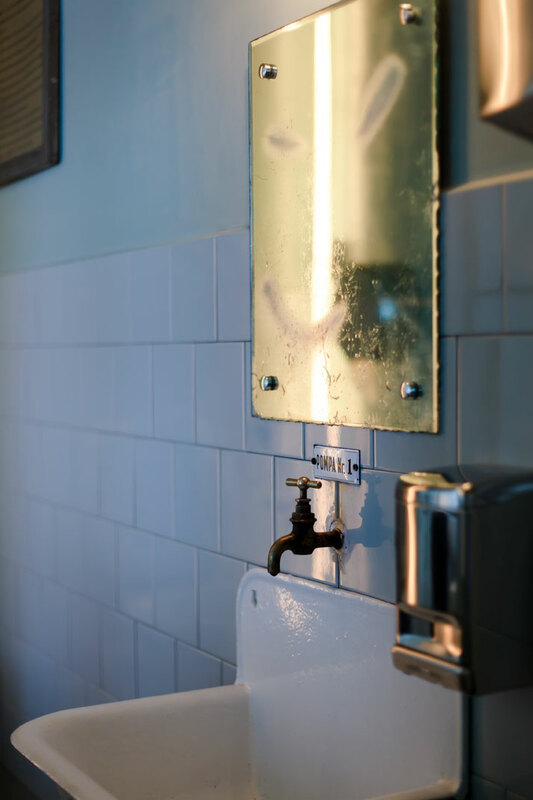 Chic, yet casually retrenched design, classy yet effortless, contemporary yet vintage, industrial yet stylishly attractive, this is accurate and bold design inspired by the country’s history. 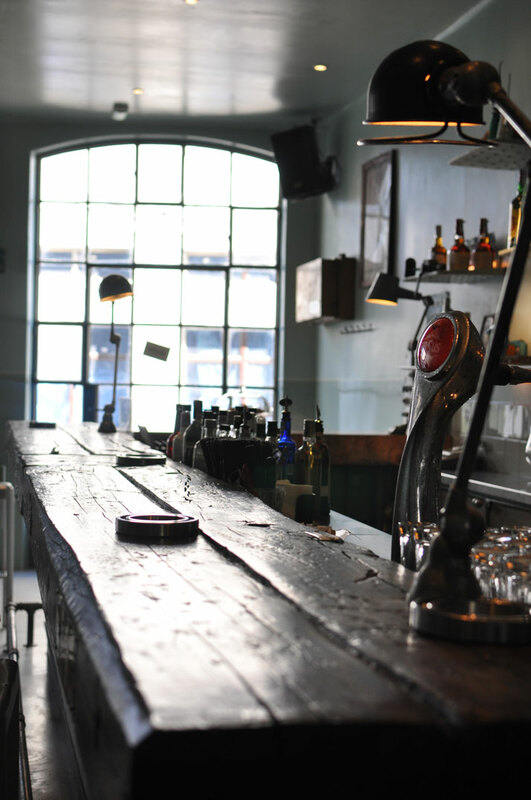 With an appealing exterior, you are immediately invited into the bar, based on the connection between the artistic expression of the past and modern entertainment. 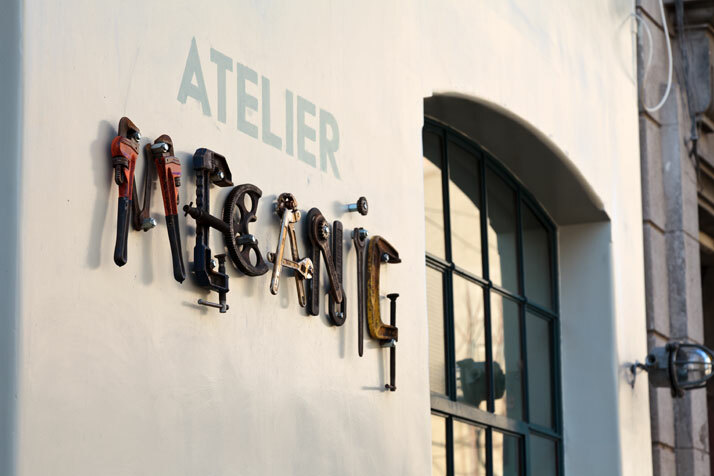 The Atelier Mecanic logo on the exterior façade is made of tools reminiscent of the former industrial zone. 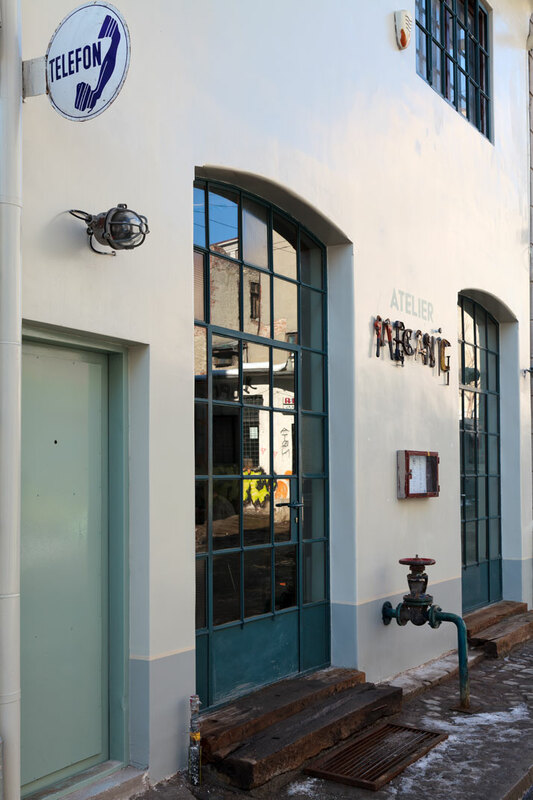 It’s façade has been left unaltered, undergoing a minor facelift which has freshened up the exterior ‘skin.’ The grid shaped iron cast doors have also been freshened up and painted in a dull greenish-blue colour, while large planks of compact wood make for the doorsteps. 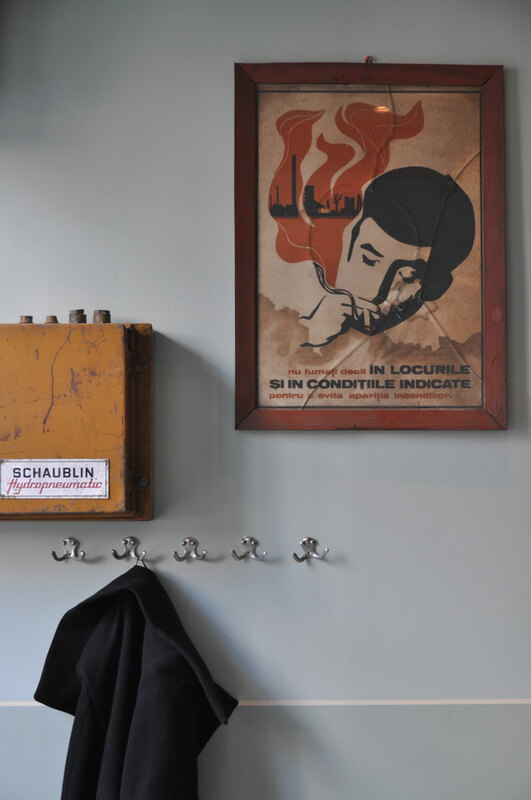 A vintage sign reading ''TELEFON'' (telephone), alongside with all the other façade elements, prepare you to experience this not so ordinary bar. 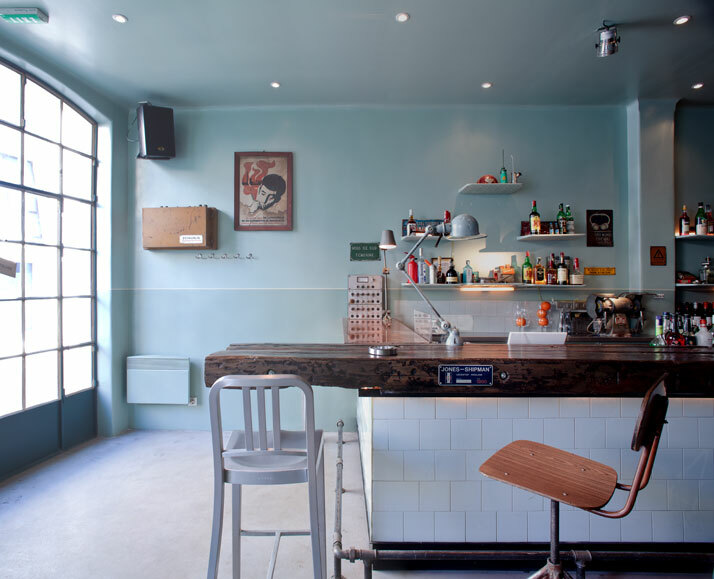 Upon entering, the concrete screed flooring sets the industrial tone, and the large L-shaped bar is the centre of attraction. 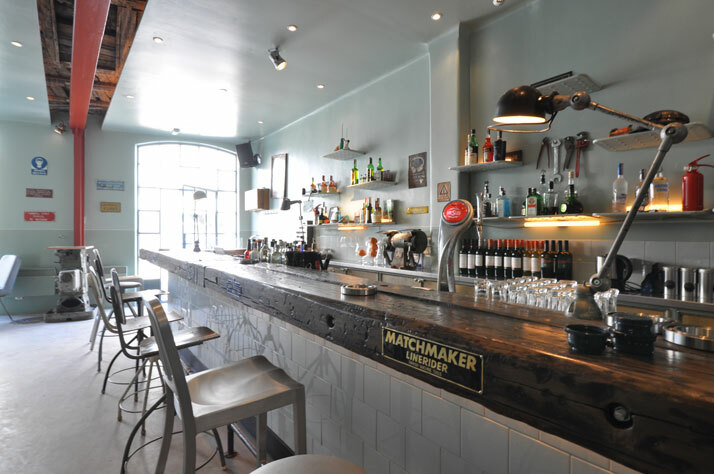 The L-shaped bar base is coated with large white rectangular tiles, while the bar top is covered with a copper sheet and large planks of compact stained wood – which we earlier saw on the entrance steps. 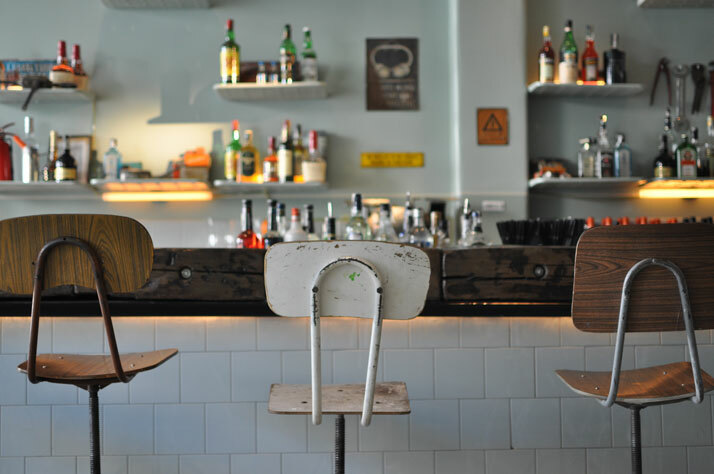 The 70 square meter interior of the bar is made up of 1950 to 1970 industrial relics, salvaged leftovers, graphics and original vintage furniture. 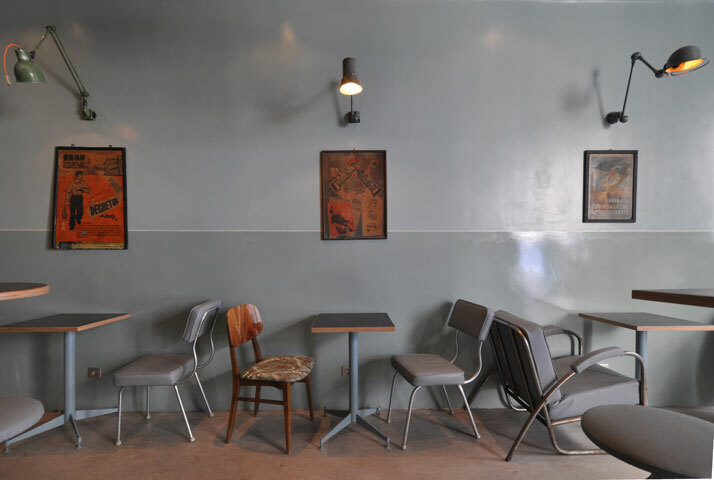 The interior is painted in tones of grey, while graphic prints and the air-con/vent ducts add a spark of colour to the monotonous yet lovely grey tones. The air- condition and vent ducts which are exposed add to the industrial workshop tone. 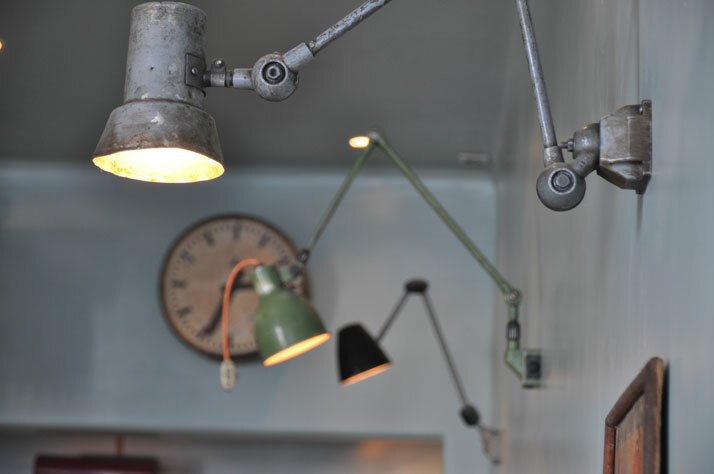 The vintage furniture in neutral colours is complimented by the attractive overhead lighting which is affixed to the walls. Each piece is unique, yet all of them seem so coherent and blend in well together. 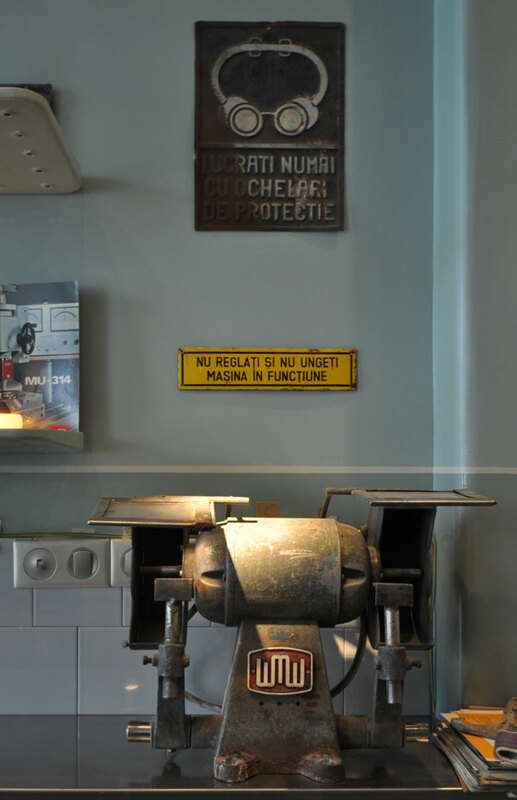 Undoubtedly, one of the most stunning pieces is the German UMF Ruhla machine which has been converted with the addition of a wooden table top to an inimitable cafe table. 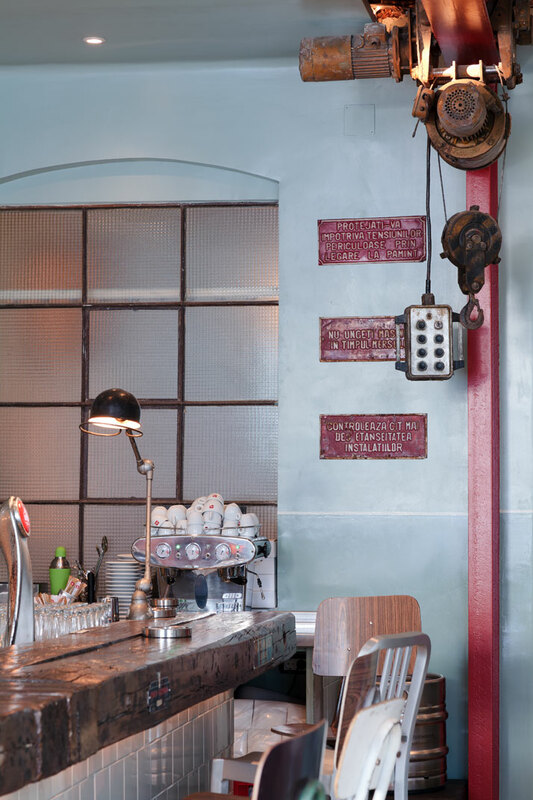 However, attention is drawn to the main industrial machine right in the centre of the space, as it goes from one end of the bar’s ceiling to the other; for this particular machine, the ceiling has been left exposed thus highlighting its existence and making its presence felt. 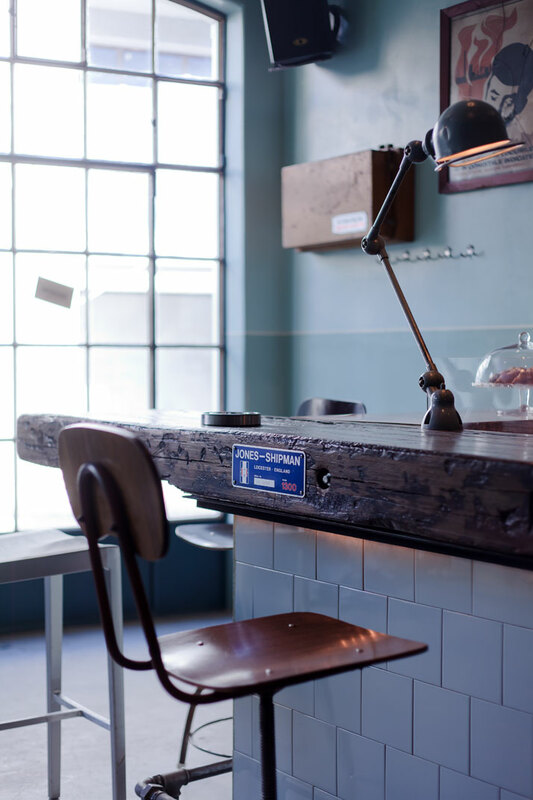 The industrial centrepiece reminds you that this space was once a factory/workshop.